Stereo microphone mixer incorporates 2 active-balanced microphone inputs with 3 unbalanced stereo aux level inputs for use in sound reinforcement applications. 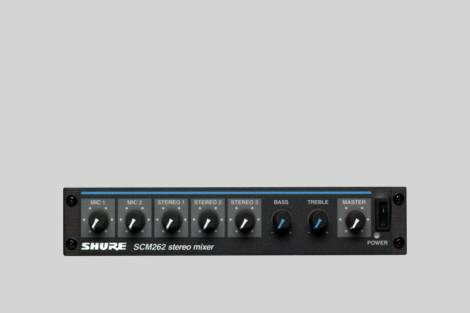 Stereo microphone mixer incorporates 2 active-balanced microphone inputs with 3 unbalanced stereo aux level inputs for use in sound reinforcement applications. Includes tone controls, 12 V phantom power, internal power, and ducking and mute function. 12 V phantom power for condenser microphones. Many smaller installations require a mixer with very specific features and capabilities. One that is easy to use. You need to integrate your microphones and stereo equipment without paying for features you'll never use. And of course, you'll need dependability. The SCM262 provides features tailor-made for your smaller application - such as defeatable "ducking", "jukebox mute", and "12V Phantom". All in a compact, user-friendly package.